Girlhood Remixed and Ink Spilling create formative summer camp experiences for youth nearing adolescence, connecting young women with STEM skills and opportunities, and giving the STEM-inclined an opportunity to embrace writing. Twin sisters Lina and Maya, both 11-years-old, have interests all over the map: soccer, volleyball, reading, and playing video games. And in the winter, they fundraise to buy hats, scarves, and shoes for people who are homeless in their town of Las Cruces, New Mexico. That changed last summer, when Lina and Maya took part in a free summer camp called Girlhood Remixed at New Mexico State University. Not your grandma’s technology camp, Girlhood Remixed gives young women a chance to participate in activities like podcasting and video production, as well as guided discussions about sexism in STEM fields and in the media. Girlhood Remixed was one of two camps created by a team at New Mexico State University and the Borderlands Writing Project that helped young adults connect the hard STEM skills they learn in school to their own life experiences and the world around them. The two camps were supported by an LRNG Innovation Challenge grant. The grants stem from a partnership between the National Writing Project and John Legend’s Show Me Campaign to help educators extend time and space for connected learning. The connected learning theory posits that learning happens on a continuum—in school, as well as at home—and is driven by students’ interests. At Girlhood Remixed, many of the campers loved video games. But they also saw the stark contrast between the way male and female characters were portrayed in some of their favorite games. In a group podcasting project, one young woman named Lynn observed that women are almost always behind men on the covers of her favorite video games. Through discussions, counselors and mentors, many of whom are passionate technologists themselves, helped the girls put a framework around their observations about sexualized portrayals of women in the media and encouraged campers to pursue careers in STEM fields. 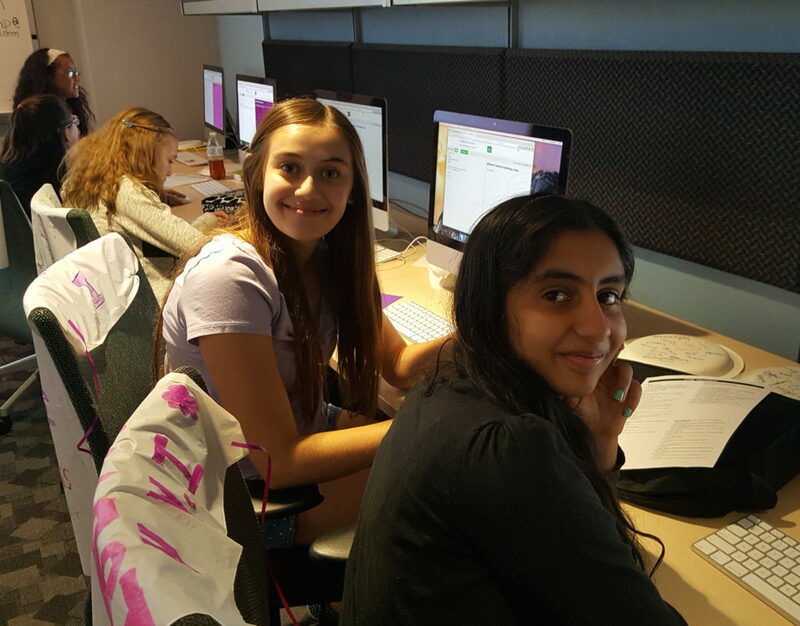 The girls used their newfound coding, photoshop, or video skills to produce final projects that reflected on women and technology. “It was important to have the students to not only consider identity as they explore who they are, but also who everyone else is saying they are,” said Karen Tellez-Trujillo, assistant director of the camps and a PhD student in Rhetoric and Professional Communication at NMSU. The camp aimed to give girls the tools to challenge expectations and portrayals, and to show girls they don’t have to adhere to societal expectations if they choose not to. More broadly, the camp works to overcome the gender, economic, and cultural digital divides that impact many students in Las Cruces. Meanwhile, the other summer camp catered to a different audience. Called “Ink Spilling,” the camp guided students in grades 7 to 12 with a STEM interest to deepen their writing, both generally and for STEM learning. Too often, STEM and writing are kept in different worlds, and the camp aimed to show young people how STEM and writing can–and should–be intertwined. Many of the students came from a unique early college high school that has a pre-medical school, and will be graduating with an associates degree in science. Building off the National Writing Project model, a day at camp included improv, free writing and sharing in giant circle, and crossing out words and letters to create “black out” poetry. Writers penned “letters to the editor,” shared journal reflections, and heard from visiting screenwriters, published scientists, and journalists.The pieces often focused on issues that are central to the campers’ Southwestern community, such as traditional folklore or water conservation. “As writers who are interested in STEM, the camp helped the students see they’re really going out into the world with a beautiful skill set,” Tellez-Trujillo said. Through the camp, one student named Nico realized he wasn’t interested in pursuing a full-on STEM career long-term, but that he still wanted to challenge himself to weave his interest in mathematics into his love of fiction. Ink Spilling and Girlhood Remixed started in 2013 on a shoestring budget. When a waiting list emerged, the organizers decided to expand the camps. The LRNG grants supported the camps’ growth, as well as the follow-up sessions later in the year where students discussed how their takeaways from the camp have impacted their in-school learning. The Borderlands Writing Project is sharing these lessons with their local community of teachers in New Mexico. The takeaways (gleaned from both the students and the camp facilitators) have become a part of a set of teacher resources and related curriculum used for professional development support. Most importantly, many of the students have continued writing or are now taking their new skills into personal projects of their own making. That includes Lina and Maya, the twin sisters who fundraise for people who are homeless. After Girlhood Remixed, they started planning how they could create a website or a video for the following winter, and use their new-found tech skills out in their own community.